Back in October 2012 with the words “I’m coming home now” Felix Baumgartner made his incredible leap from a balloon floating 24 miles above the Earth. I don’t know about you, but I was GLUED to my screen that day. If you were watching you know that Felix broke the sound barrier… with his BODY… and then began a terrifying out of control spin that everyone feared he may not recover from. But of course he, thankfully, did. 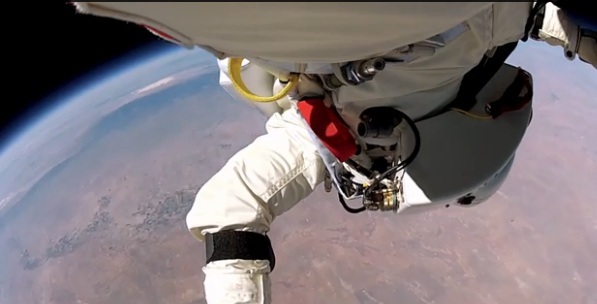 Now Red Bull Stratos and GoPro have released a new video that shows us from Felix’s perspective exactly what he was going through. And yes, it IS as vertigo and nausea producing as you’re imagining. It’s also absolutely incredible… and awe inspiring… and so unbelievably beautiful at times that it will bring tears to your eyes. Take it full screen, but be prepared before you do. Previous Post Previous post:Beard. No beard.